When in the avifauna world we talk of Guineafowl, immediately our mind goes to that rather stange and different from the other hens that we often see appearing on our Sunday tables to vary the usual festive meal. Even if now entered by force in our modern farms and in our feeding, this bird remains always linked to tales and old African stories and, from the vulgar name, we have given it, to memories of the old Egyptian civilization. 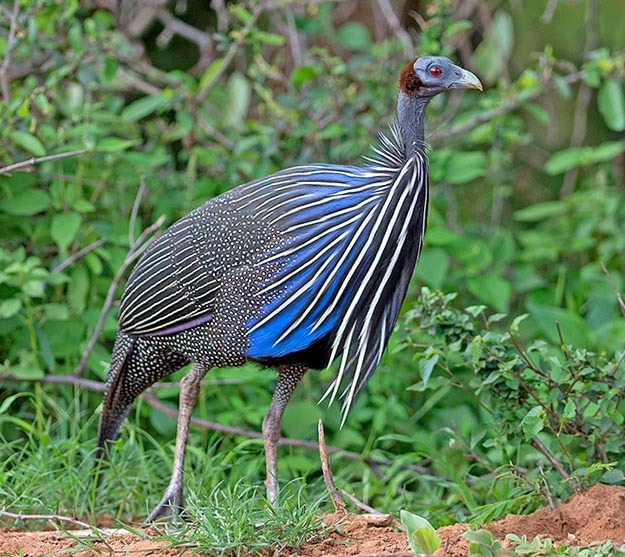 But the Guineafowls living in Africa, their origin land, are eight species and each one shows characteristics and liveries at times unbelievable. This is the case of the Vulturine Guineafowl (Acryllium vulturinum Hardwicke, 1834) the biggest species and by sure the one having the most beautiful livery. A bird belonging to the order of the Galliformes and to the family of the Numididae and the only species assigned to this genus. We cannot surely imagine that a simple hen may have colours of this kind and of this hues, colours that rarely do appear so neat and bright in any other bird. Still in the stories of our soldiers, sent in the XIX century in African lands for unlikely conquests, they recall how much the Guineafowls were a daily food when the ration in the camp began to lack. Somebody then remembered of birds with cobalt blue feathers, with haughty and elegant posture that scratched about in large numbers all around and wary that escaped with shrewdness among the thorny bushes at the first notice and only rarely took the flight loudly and all together, when feeling menaced. Even today with other means, but less functional than the guns, the local populations draw them in good number for nourishing and for trading. The Italian vulgar name of faraona, gallina di Faraone or di Numidia is clearly referred to the old Egyptian pharaohs and to their history even if the whole thing comes from the fact that the first arrivals of this bird in Europe passed through that part of Africa and hence the reference was quickly done. For what is concerned the reference to Numidia, the present area between Tunisia and Libya, even if it is presumable that in the old times this bird now disappeared was present, they have incurred in the same error done for the Demoiselle crane – Damigella di Numidia in Italian (Anthropoides virgo) seen that by that time all what came from the north-western African coast was said to be coming from this area. On the other hand, the English name given to this bird, Vulturine Guineafowl, refers to Guinea meaning at the time with this name, to indicate all what was coming from new worlds, Americas included. The ethymology of the genus Acryllium comes from the diminutive of the old Greek term “akris” = tip, pointed, due to the pointed shape of the feathers and also due to the tail presenting a particular and very sharp elongation. The specific name vulturinum comes from the Latin “vultur” = vulture, like a vulture, due to the shape of the hairless head rightly resembling this bird. Some common names are Vulturine Guineafowl in English; Geierperlhuhn in German; Pintade Vulturine in French; Pintada vulturina in Spanish; Damigella di Numidia in Italian, and an unpronounceable Fusahorohorochou in Japanese. 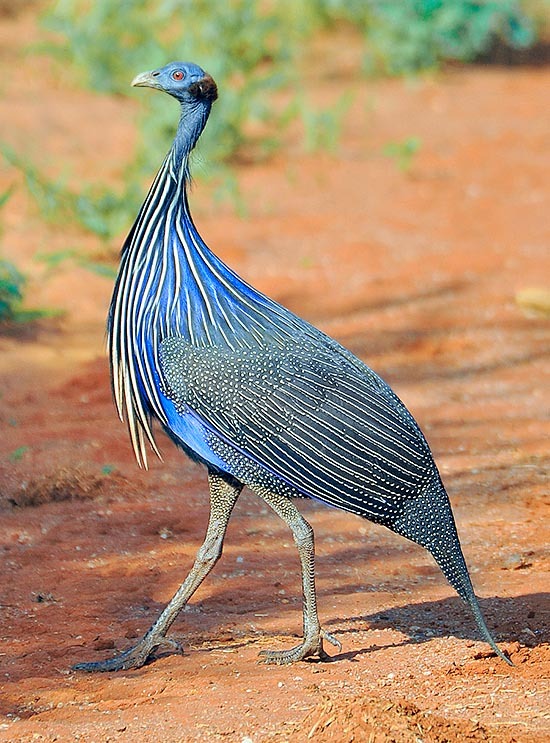 The vulturine Guineafowl, like all species of Numididae, lives only in Africa though being present now in almost all continents at the state of amateur breeding. It lives in the eastern part of this continent, in particular in South Ethiopia, Somalia, Kenya and North Tanzania. It is naturally a sedentary bird that hardly gets out from its home territory therefore spends its whole life in the same area, often very reduced and hidden in some corner of the bushy savannah. The territory of this Guineafowl is highly fragmented so that often it is absent for some kilometres and then is found very common in other nearby area. 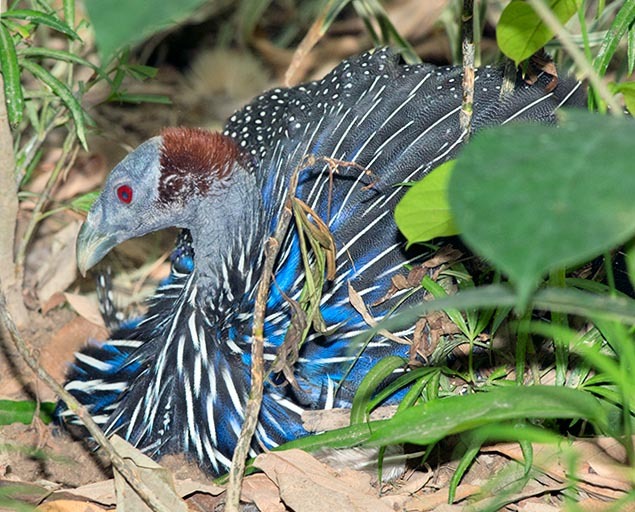 Also this bird has become part of many zoological gardens and in the nurseries of passionate ornithologists but not yet at industrial level even if the size and therefore the flesh are much more abundant than in the traditional Guineafowl. It is nowadays considered as an exhibition bird thanks to its extraordinary beauty. This Guineafowl lives typically in dry locations, grassy, thickets of acacias with ground covered by thick brushwood and the typical African savannahs. It also loves thick scrublands but having spaces without vegetation where it can scratch around and also spaces in the underwood where to run and get shelter in case of danger. It does not need proximity of water but does not disdain to use it when available. Of course, only for quenching its thirst because the cleaning of the feathers of the galliforms occurs only by dust bathing. The most evident morphological look in this bird is the head that holds a real vulture characteristic, with a very strong beak on a rather small head and practically similar to that of the bird of prey, bare head with bluish grey skin surrounded by a crown of reddish down somewhat reminding a monk’s tonsure. The eye is carmine red and the neck is rather long and streamlined. 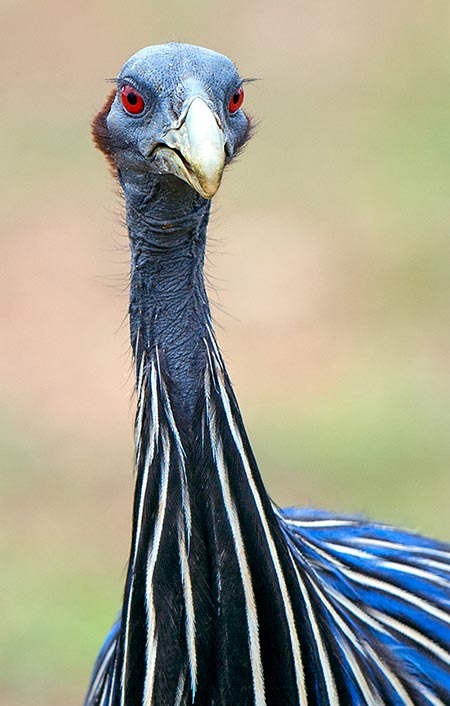 Consequently, the look is very aggressive and well different from the other Guineafowls. On the contrary, the body exhibits a splendid livery, delicate and fluffy. The chest is very bright cobalt blue, dazzling, almost unthinkable on a bird. On this wonderful chest hang long tapered and fluttering feathers that seem to be white streaked ribbons surrounded by the same colour as the chest and forming an apron hanging from the neck. The rest of the body, wings included, is black studded with a myriad of white drops lined up, only on the wings, in thin and perfectly ordered lines. The tail is fairly marked, pointed and turned towards the ground. There is no distinction between the sexes whilst the young have a grey-brown colouration and the blue colour appears duller. The remarkable size of this Guineafowl place it at the first place in the group. It can be up to 70 cm long, with a wingspan of about 80 cm and a weight that may reach almost the 2 kg. The vulturine Guineafowl rarely takes off as it prefers to run away at high speed into the nearest bushes. Only exceptionally it takes off when absolutely obliged and does it so in group, all together and very uproariously. Like all galliforms, having rather reduced wings for their size, they have a very fast and very noisy beat, traumatizing for the predator, when emitted by more than twenty individuals that take off at the same time. 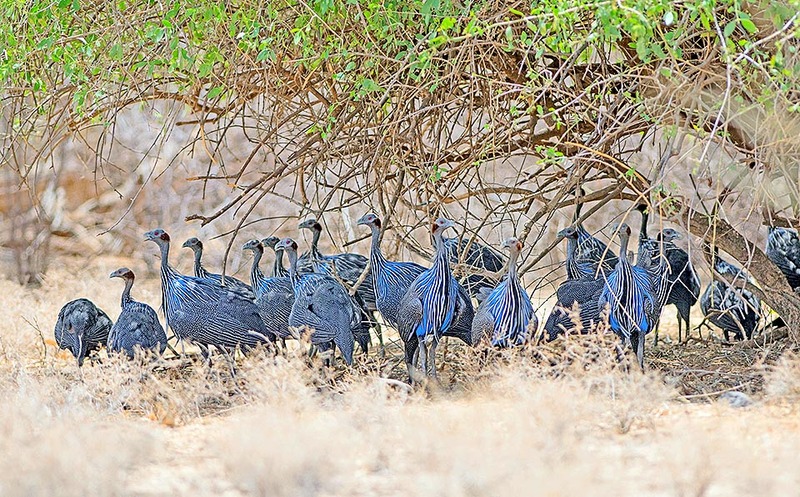 The life of the vulturine Guineafowl is very social but limited to the clan it belongs. Usually it lives in groups of 20-30 birds formed by extended family groups that maintain a strict control of the territory at the cost of hard battles with their similars. The couple forms inside the clan but it appears to be lasting only one season. It mainly nourishes of seeds and of invertebrates but also of fruits fallen on the ground or berries. At times it has been sighted while seizing small snakes probably mistaken with other small animals. It often follows troops of monkeys or other frugivorous birds staying to scratch under the trees where they are perched, waiting for falling fruits or of leftovers. The nest is placed on the ground in a small depression dug by the female and well hidden under a bush where are laid up to 8 cream coloured eggs, slightly darker than those of our domestic hen, number that may increase considerably in the case of more broody hens having chosen the same nest. The eggs are hatched only by the female for about 28-30 days. The chicks come to life already covered by a very camouflaged down and leave the nest a few hours after their birth. They are at once independent in the feeding but they follow the mother for some time in order to get protection from the predators as well as for getting a shelter during the night. Both parents do defend the chicks against possible attacks with diversionary manœuvres and also with direct attacks to the assailants. They fly after about three weeks and since then they become totally independent. This Guineafowl counts several foes, first of all the big diurnal raptors but also jackals, foxes and felines that make them sudden ambushes among the brushwood. These birds sleep in group on trees, staying well close each other during the night as security against attacks of possible night predators. Also the big owls stand among their predators. Although living in a restricted area and being possibly subject to meet the eventual risks typical to this limitation, the vulturine Guineafowl is not considered as an endangered species.